Full Disclosure: I do get a commission if you click and buy Bluehost through my link at no extra cost to you. Hey! 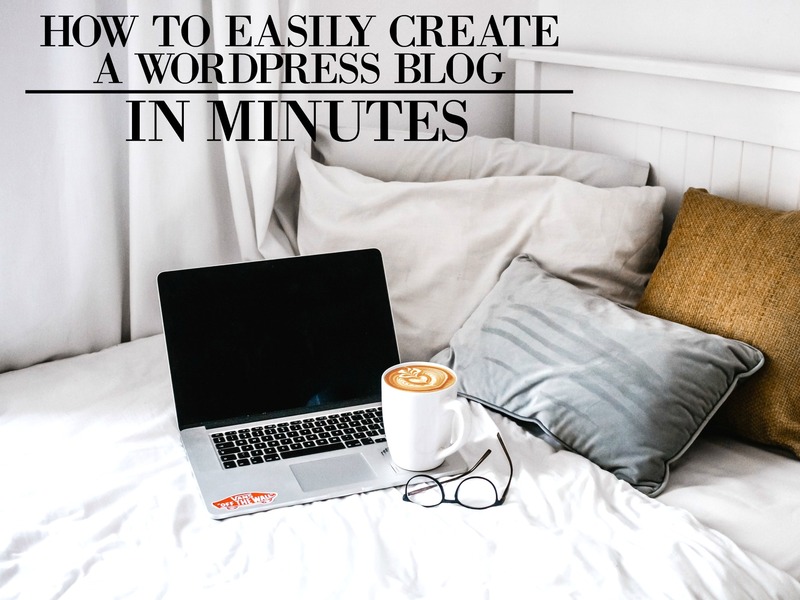 Today I’m going to be showing you how to quickly and painlessly create your own WordPress blog (even if you’re not tech-savvy!). It only takes about 6 minutes (yep, I’ve timed it), and I’ve broken it down into simple steps for you. Blogging has personally changed my life; it’s given me the ability to make $3,000 in my 3rd month of blogging, helped my husband quit his job, and allows us to travel the world full-time. And right now, you can start your own WordPress blog for super cheap. I’ve been able to work out a GREAT price with Bluehost just so that you won’t have to spend a TON on hosting for your blog as well as a free domain name (but it’s only when you click through my link below!). Just make sure to act fast because I’m not sure how long this deal will be around! You can get your blog started here and follow the fast & simple step-by-step guide below. Which hosting for your blog to use. Which ones NOT to use (and why). How to find the right blog name. Which plans to go with. How to set up your blog theme. How to navigate your your WordPress dashboard. How to publish your first post! PLUS.. Insider tips and tricks as well as my contact info if you need help. To begin, if you’re wanting to have your own self-hosted blog, then I’d definitely go with Bluehost. They’re the only hosting company I recommend to my following because they’re AMAZING for beginners – cheap, 24/7 helpful service, one-click WordPress install button, and you don’t have to be tech savvy to use them (at all). Also, it was one of the top hosting companies in 2019 and… there are WAY too many stories of other bloggers having headaches when dealing with other hosting companies (and I DO NOT want to lead you their way). Plus, there are over 2,000,000 other bloggers using Bluehost, so you’re in good company! Now starting a WordPress blog is super simple, which is why I like showing others how to do it as well. And when you use my special link, you’ll be able to get hosting and a FREE domain name (with a 12 month or more plan) for just $2.95 a month – a 63% savings! So why not go with a free blogging site? Now this part is VERY important to discuss, because you do NOT want to go with one. They can take your blog away from you at any point. And they don’t have to give you a reason why. This is something I’ve known to happen to big bloggers like Michelle from Making Sense of Cents (when she was just starting out). And this means that all of that hard work you put into your blog posts will just go away, and I DO NOT want this happening to you. ALSO, if their site happens to be taken down or they’re bought out and shut down, your blog and content will go away permanently. Which is another great reason to make sure your work is protected. In the end, you can think of it this way: It’s a single point of failure. If that one thing is taken away, then the rest falls like a house of cards. You want to be self-reliant, not dependent on someone else. Second: You’ll be able to make money: Making money with a free blogging platform is extremely hard. Many readers and companies will turn away from free blogging sites because they look VERY unprofessional. This means that sponsors, affiliate programs, and ad networks will choose not to work with you. And readers who would have bought or read from you will go to a blog that looks like they’re more of an authority on the subject you’re writing on. Third: YOU will have control over your site. Free blogging platform companies (like Blogger) may show ads on your site that you do NOT want on there. Also, you’ll be able to determine how your site looks if you’re self-hosted with Bluehost. Which to be honest, makes sense. If a company is being represented because their name is attached to your blog name (example: yourcoolblog.wordpress.com), they’re going to want to control what you do. So if you’re self-hosted, then there’s NO LIMIT to your creativity and individuality. And Lastly… you can’t use plugins with a free blogging site. Plugins are those amazing features that self-hosted WordPress blogs have that allow them to protect their site from hackers, get subscribers, make their blog look amazing, give them features that make blogging more simple and easy, gather helpful information on their readers, and SO much more. And sadly, with a free blogging site, you won’t be able to use these. Side Note: You can sign up here for a list of FREE plugins every new blogger needs! In the end, I just really want to save you the trouble of having to deal with these BIG inconveniences. I don’t want to see you lose your hard work or not be able to express yourself the way YOU want to because of rules set in place by those sites. If you are already on a free blogging platform, you can hire someone for a small fee to migrate your site over to a Bluehost WordPress site. No tech work for you! You get your own FREE domain name. If something goes wrong or you need help, their tech support is SUPER helpful! You get WordPress for free when you go with Bluehost. Bluehost has a one-click install for WordPress (Yes!). It’s extremely affordable, being just $2.75 a month (only through my special link). You can get your money back if you feel that this isn’t for you. It’s super easy to use, especially when you’re not tech-savvy. And it’s even easier when you follow the tutorial down below. You’ll look more professional and will be able to make money with your blog if it’s self-hosted. It comes with awesome FREE blog themes. As a side note, I just wanted to let you know that if you’re having ANY trouble at all when signing up or setting up your blog, just email me at chasingfoxescontact@gmail.com. I have an awesome contact from Bluehost who will be able to help you out quickly and efficiently. I want to make sure that you have THE BEST help possible. We all need it when starting out (I would know!). However, if any of these things interest you, then you will first need to start out with going to their signup page here and follow the step-by-step guide below. I honestly can’t emphasize enough how important it is to be self-hosted if you want to make money blogging or gain a following more quickly. And when it comes to being self-hosted, Bluehost is the best way to go. This company is highly recommended by huge bloggers like Rosemarie from The Busy Budgeter and ProBlogger.com or Pat Flynn from Smart Passive Income. Plus, it will save you the headache when trying to figure out how it works or if there are problems. So feel free to sign up here and follow the tutorial down below. And again, remember, if you’re having trouble with the sign up process or post sign up, just contact me at chasingfoxescontact@gmail.com. I’ll be able to get you the help you need. I know what’s it’s like to be new to something, feel confused, and need help. Now when you first sign up with Bluehost and start the process, you’re given the option for a free domain name which is super helpful when first starting out. There’s no need to pay extra for something when you’re already paying for hosting. And if you don’t already have a domain name picked out, then definitely check out our guide on how to find the right one for you. There’s no fluff (I promise!) my husband (who wrote the post) made sure to give you the right help since we BOTH know how hard it can be to find the right blog name. Also, the site Bust a Name is a great place to enter in some keywords and see possible combinations for your blog name (especially when you have time to kill). And LASTLY, you’ll want to sign up with Bluehost and get your domain name RIGHT AWAY because once it’s been searched for (by you) others can see it and buy it themselves… and then sell it at an OUTRAGEOUS price (like $3,000+… ??!!). Important Side Note: If you don’t know what you want your domain name to be, Bluehost allows you to choose it later while still getting it for FREE. Now when it comes to picking out the right plan, I would make sure to just go with the Basic Plan. As a new blogger, there’s no reason for you to pay more for things you don’t need right now. Also, you can just upgrade later if you want to and pay the different. No hassle at all! Now my next tip would be to make sure you’re purchasing a 12 month or more plan (paid up front) since this will give you the free domain name and save you a lot of money down the road – they charge more if you have a monthly plan, which makes this the best option. ALSO by going with a monthly plan, you run the risk of your site accidentally going down. This can sadly happen if you don’t renew your domain name or your card expires. Then you’ll end up losing pageviews and income which makes being on a monthly plan pretty risky. So just know that the bigger plan you get, the more you can save. And in my opinion, going with the 36 month plan is the BEST deal (it’s what I went with!). It’s cheaper than the other plans and you won’t have to think about renewing until 3 years later. Now if a free domain name is something you want, then continue to follow along so you can get your hosting and domain together quickly and easily. Again, I would really make sure that you get a 12 month or more plan, instead of a monthly plan, so that you can save a lot of money and not run the risk of your site being pulled down due to an expired card or other issues. Also keep in mind that even though you are paying it all up front, a 12 month plan will only cost you $59.40 and the 36 month plan will cost around $106. And these yearly plans ensures that you DON’T pay more by going monthly, give you a FREE domain name, and peace of mind that your site isn’t going to go down because the hosting wasn’t renewed that month. – In the end, if you go with more, the less you’ll pay and the more benefits you get. Plus! If you want your money back, Bluehost will be happy to give you a return for the time you didn’t use. Then you don’t run a risk of losing money. If you’re unsure about blogging, the year plan might be great for you so that you don’t feel committed to it for a very long time. It gives you the option to try it out for 12 months and see how you feel at the end. Lastly, feel free to uncheck all of the add-ons. The ONLY thing you will really need is Domain Privacy Protection (for $0.99 a month). This just ensures that personal info, like your email address, isn’t out there for others to see. And just remember before we continue on that if you use my special link, you’ll get an amazing deal others won’t get as well as a free domain name. Click on the “Get Started” button when you go to Bluehost. Choose the package you want. Give them the domain name you want to use, the one you’ve already registered elsewhere, or skip for now (until you can think of the right one later – it’ll still be free). Fill out the form for your personal and payment information. Then choose a secure password. Again, if you have trouble with any of these steps OR you have some questions about hosting, remember that you can contact me at chasingfoxescontact@gmail.com. I have a GREAT person at Bluehost that will be able to help you out quickly, and I don’t want you getting confused along the way at all. Now, if you’ve already purchased your domain name on a site like GoDaddy.com, you can easily connect it to your Bluehost account. Side Note: If this is something you didn’t do, then you can continue onto the next step. Also, if this step makes you nervous (because if you’re not tech savvy like me, then anything techy can make you nervous), then feel free to go to GoDaddy’s support page for help with this. When it comes to “Name Servers,” they should look something like this… ns1.bluehost.com; ns2.bluehost.com. After this, you can simply head over to your Bluehost account, go to “Domains,” click on “assign,” and follow the SERIOUSLY painless steps! Now this step is VERY simple! Installing Wordpess with Bluehost is FREE and only requires you to click one button! After choosing a password, Bluehost will ask you to pick a free or paid theme for your blog, but if this is something you want to do later, then you can go onto the next step. Or you can pick one now and change it later on if you want to! Lastly, you can choose the options, “Personal,” “Business,” or “I don’t need help,” and you’re done! Congrats! You’re OFFICIALLY a blog owner! This is such an exciting place to be, I would know, it’s changed my LIFE. Now if you’re having any trouble with signing up or navigating your NEW ( ) WordPress blog and Bluehost dashboard, feel free to contact me at chasingfoxescontact@gmail.com. I’m here to help you out! Easy Tips on How to Navigate Your WordPress Site! When creating a post, you can click on “Media” to download images. Installing Plugins: Simply hover over “Plugins” on the left side and choose “Add New.” Then you can simply search for the ones you want such as “Google Analytics.” – You can also sign up here to get a list of FREE plugins every new blogger needs! Install Jetpack: Jetpack is a great FREE plugin that’ll protect your site from attackers/spammers, optimize the speed of your site, AND you’ll get the option to see your blog’s stats. This means you’ll get to see how many people have been on your site for that day, what sites they’re coming from, and how many views each post on your blog has for the day. For those who want to have fun with sending out newsletters to their readers, you can get started with Convertkit (Great for non-tech savvy people… seriously). Plus, I have a post explaining how it works here. When looking for a good blog theme to make your new site look amazing, I would definitely go with Genesis. I know many bloggers who use their themes and they’re very affordable (with FREE ones as well!). And to pick a theme for your site using WordPress itself, all you need to do is hover over “Appearance” (in your WordPress dashboard) then click on “Themes” and choose one of the great options they have. – As a quick note, just know that if you pick a paid theme (like with Genesis) they’ll be more fast and secure, easier to install and customizable, have better search engine optimization, and designed for desktop AS WELL as mobile. Here are some posts on blogging to help you get started!